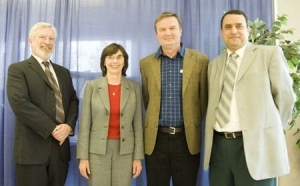 On hand for UBC Okanagan's first Teaching Excellence and Innovation Award presentation were, from left, UBC Okanagan Deputy Vice Chancellor Doug Owram, Assoc. Vice President Learning Services Gwen Zilm, award-winner and Assoc. Prof. of Mathematics Blair Spearman, and Assoc. Vice President Academic and Research Alaa Abd-El-Aziz. Blair Spearman, an associate professor of mathematics at UBC Okanagan, has been selected for the first-annual UBC Okanagan Award for Teaching Excellence and Innovation. Gwen Zilm, Associate Vice President Learning Services, spearheaded the creation of the award, which includes a $5,000 prize, to recognize outstanding teachers at UBC Okanagan, as nominated by students, alumni and faculty colleagues. "This is the most important award we give out," says Doug Owram, Deputy Vice Chancellor, noting the importance of teaching in creating an outstanding experience for students at UBC Okanagan. "We see the undergraduate experience as a core part of what this campus is all about -- it is something more than earning credit for understanding a body of knowledge. We are fortunate in that we have such excellent teachers." In nominating Spearman for the award, one of his students -- formerly a biology major -- noted, "It is a common belief among first-year science students that calculus is the subject one must avoid. Like most science students I was required to complete this course as a prerequisite for my degree. I started to enjoy calculus because the lectures were well presented and easy to understand. Come the end of the year, I decided to switch majors." Alaa Abd-El-Aziz, UBC Okanagan's Associate Vice President, Academic and Research, chaired the selection committee. While the committee considered many worthy nominees, he says it was the student recommendations that made Spearman the choice for this inaugural award. "The students have spoken and the committee agreed," he says. Spearman earned a PhD in mathematics from Pennsylvania State University in 1981. After a year working for the Canadian Dept. of Defence, and a few years teaching at various institutions, he came to Kelowna in 1988 and has been a math professor here ever since. "Students should be given the opportunity to succeed," he says, adding that getting to know his students is important. "I try to meet students, even if it's just a brief meeting, early on. It really helps." Over the years he's found that some students arrive with gaps in their math skills. It's often an obstacle they can readily overcome. "Most students who have problems with math think to themselves, 'I don't understand anything,' even though it's only a small thing they've missed that may be getting in their way," he says. "Once you help them figure out what that small thing is, they're off and running." Spearman credits his students over the years for helping him be an effective teacher. "I've been lucky to work with a lot of great students," he observes. "They're pretty smart." As the inaugural recipient of the award, Spearman becomes the first member of the UBC Okanagan Academy of Teaching Excellence and will be acknowledged at UBC Okanagan's Congregation ceremony on June 8. Members of the academy will participate in the selection process for future teaching award nominees.